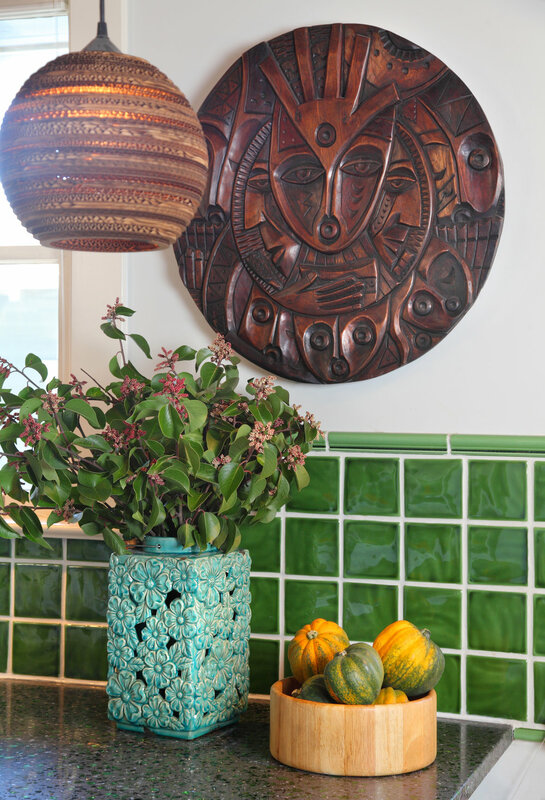 This bright West Hollywood bungalow features a custom remodeled kitchen with a collection of handmade elements reflecting the homeowners love of nature and commitment to sustainable materials. Locally made cabinets, countertops made with recycled Heineken bottles, handmade ceramic backsplash tile and cardboard pendant lamps make for a truly unique space. This cook's kitchen has a place for everything and everything in its place! Built-in wall shelving provides extra space for storage and creates a cheerful display of dishware and other kitchen utilities. A hard working home office tucked away in the corner of the kitchen. Custom designed to perfectly fit the compact space, this corner nook gets plenty of natural light. A countertop made from recycled bowling alley lumber makes the utilitarian space special! Framed artwork by Gwen Samuels adds unique handmade detail atop the desk.